3D print neoprene dress, by Gauri and Nainika, New Delhi. Filigree earrings, by Eina Ahluwalia, at Minerali, Mumbai. 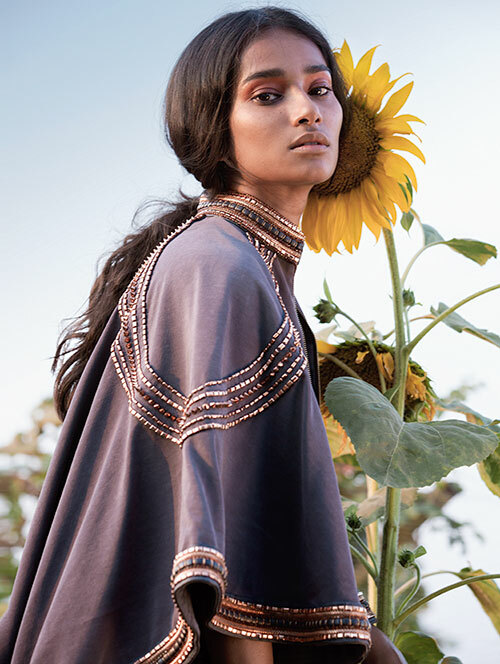 Gunmetal studded cape, by Kanika Saluja, for Anaikka, New Delhi. Left: Graphic sequinned romper, by Malini Ramani; faux fur cuff, from Rara Avis. Both in New Delhi. Right: Dusk blue jacket and pants, both by Ashish N Soni, New Delhi. Burgundy patent loafers, from Gucci, Mumbai. Botanical print sheer panel maxi, by Paras and Shalini, for Geisha Designs, Noida. Stone ring, from Zariin, at Minerali, Mumbai. Left: Sheer panel maxi, by Malini Ramani; sunglasses, by Tom Ford. Both in New Delhi. Geometric mirror detail cuff, from Isharya, Mumbai. Right: Off-white linen trousers, by Dev R Nil, Kolkata. Jute brown boots, by Rajesh Pratap Singh, Mumbai. Multi-tier frill dress, by Reynu Tandon, for Mynah Designs, New Delhi. Single chain haathphool, by Eina Ahluwalia, at Minerali, Mumbai. Bell-bottomed neoprene jumpsuit, by Pankaj and Nidhi; metal drop earrings, by Eina Ahluwalia, at Minerali. Both in Mumbai. Left: Off-white linen trousers, by Dev R Nil, Kolkata. Right: Monochrome neoprene crop top, by Hemant and Nandita, New Delhi. Faux leather pants, from Diesel Black and Gold; metal and stone earrings, by Nitya Arora, for Valliyan, at Minerali. Both in Mumbai. Left: Denim jacket and pants, both by Rajesh Pratap Singh, Mumbai. Right: Printed shirt dress with fringe detail, by Masaba; high-cut boots, from Stuart Weitzman; studded messenger bag, by Christian Louboutin. All in Mumbai. Leather bangle, from Rara Avis, New Delhi.